This is the time of year that strawberries flood our supermarkets, filling us with expectations of fresh juicy fruits and pies. Sadly, a lot of those strawberries are commercial varieties, meant to ship and maintain shelf life. Neither juicy nor full of that good, old-fashioned flavor, they’re seldom good for fresh eating and take more than a cup of sugar to make themselves worthy for a decent pie. On the other hand, smaller strawberry growers are opening up their roadside stands and those berries, depending on the grower, tend to be the real thing. The problem with good, small-producer strawberries is that they often sell-out on a day-to-day basis and are available for only a short time near the end of spring. Aromatic and bursting with flavor! 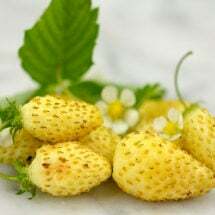 This small yellow strawberry (Fragaria vesca) is very tasty and unique looking. A favorite with many of our local customers who actually prefer the taste of this yellow alpine type to the more common red varieties. The best strawberries, of course, come from your home garden. When you grow at home, you choose the cultivar and you control the growing conditions. And while establishing and maintaining a strawberry patch might seem like a lot of work, it’s really not when you consider that a well-cared for strawberry plant can give you years of delicious pies and fresh-eating. Strawberry plants come in three types: June-bearing strawberries that fruit once a year (the name gives you a good idea when though the harvest can begin in May and even April in moderate climates); ever bearing strawberries that yield two harvests, one in spring and one in the early fall; and neutral strawberries that flower and produce fruit all season long. While the first of June is not too late in most areas to plant June-bearing strawberries — if you can find them available — it’s best to plant them in early spring as soon as the ground can be worked. Even if you’re not growing strawberries this year, June is the perfect time to start thinking about starting some next season. 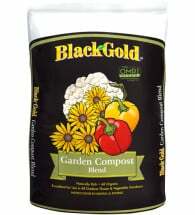 Pick a place where you haven’t grown tomatoes, potatoes, peppers or other solanaceous plants of the nightshade family. 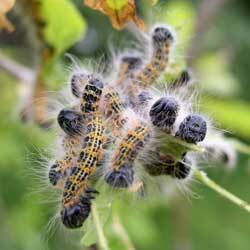 These plants, as well as raspberries and blackberries, can host the fungi that causes Verticillium, Fusarium wilt, and other diseases. 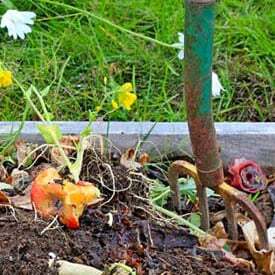 The fungi can persist in soils up to four years. It’s best to locate your patch in established garden soil, rather than sod. The grubs that live among turf roots will still be there when you pull up the grass. They also happen to like strawberry roots. Plan to put your strawberries in the sunniest spot you can find. Yields are particularly dependent on how much sunlight your plants get. Strawberries that get six to eight hours a day of sunlight will be okay but they won’t produce a crop of berries like the patch that receives ten hours of sunlight. 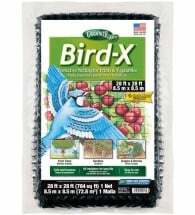 Available in several sizes, Dalen® Bird Netting is designed to protect fruits and berries from thieving pests. 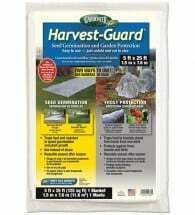 Can also be used as a temporary fence to protect shrubs, trees and vegetable gardens from deer damage. 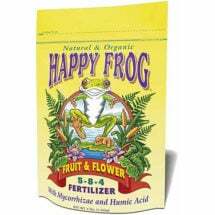 Start improving your soil. Strawberries need both excellent drainage and good water retention. They don’t do well in poorly drained, clay soils nor do they do well in soggy places. 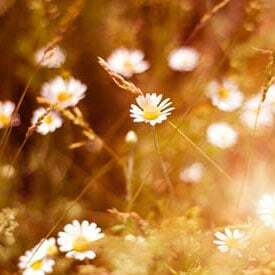 It’s a good idea to work in both drainage aides, like vermiculite, as well as moisture retainers like sphagnum peat moss or coco coir (both do double duty, retaining water and facilitating drainage). My grandfather liked to add sand to his strawberry patches to help with drainage. 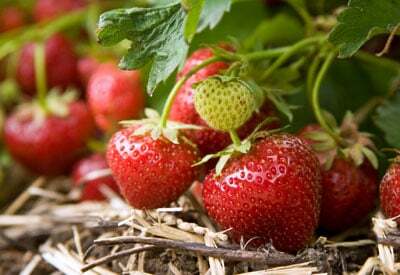 Strawberries do best with a soil pH of 5.5 to 6.5, slightly more acidic than most gardens run. That’s another good reason to plan a year ahead. 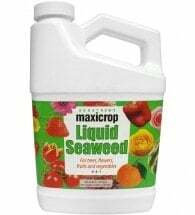 Adjusting soil pH, say adding elemental sulfur, to lower pH readings, requires several months after the sulfur is added to allow those soil microbes to convert the sulfur to useable forms. In other words, don’t expect to add sulfur (or limestone if you’re trying to go the other direction) and achieve the desired result the next day. Putting your patch inside a raised bed is a good idea. The soil quality is easy to control and maintain inside the box and the box helps keep the plant’s runners from spreading where you don’t want them. Those runners are something you want to encourage. They’re also why you will want to give your plants plenty of room. 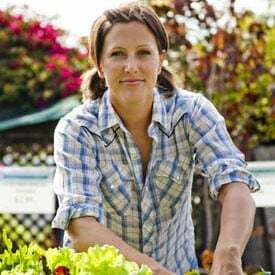 No matter if you’re using the “matted row” system, in which you let runners form freely and root where they will, or the “space-matted row” system, in which runners are carefully controlled and pinned into the perfect, well-spaced position that you choose, you’ll want to locate your plants at least 15 inches and as many as 24 inches apart in rows separated at least 3 feet apart to provide room for the daughter plants that will grow from the runners. This is particularly important for June-bearing types. Can you just stick a couple of strawberry plants here and there in you landscape? Of course you can. They also do well in pots. 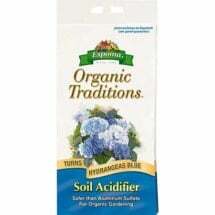 Once you get your patch located and your soil in shape it’s time to plant. 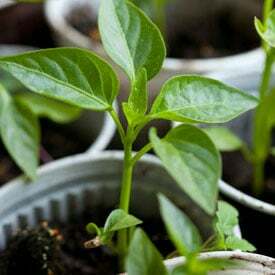 We’ll go into the planting and care of your established plants in another post soon. In the meantime, find good tips on growing strawberries from these reputable sources, here and here (PDF). my husband started putting them all over the yard, and I was skeptical, we have 2 huge deador cedar trees with allot of shade. After a couple of years, they have blended into the landscape quite well, and he comes in every morning with a handful of strawberries for my smoothie. (sometimes I save for desert and put on ice cream, yummy.) Along with that he put in 6 blueberries (also acid lovers) which are actually starting to produce. I knew the acid soil from the cedar would be good, but always had shade plants. I have been pleasantly surprised.